Jewelry design is an art. It involves the creation, fabrication and rendering of jewelry drawings and models. The ancient practice of goldsmiths and metalworkers has evolved into a billion dollar industry transforming along from ancient cultures to the machine age. Jewelry design is a functional art as it can be worn or used. Before a jewelry article is fabricated, design concepts are sketched and then detailed technical drawings are generated by jewelry designers. These professionals are trained in technical aspects and fabrication techniques. Traditionally, hand drawings and drafting methods were used to design jewelry. Today, computer aided design and manufacturing programs are used to create drawings and models. Once the design is finalized, it is rendered in silver, gold, platinum or other metals. Early jewelry commissions were started by nobility and privileged individuals to commemorate an event or to adorn themselves. Early jewelry designs incorporated enameling and repousse. These methods rendered jewelry which demonstrated wealth, position and power. Jewelry design has remained relatively constant over the years. Jewelry has evolved along with technology and fashion trends. Today’s use of technology in the design stages allows artist to quickly see the results of their work. The public’s attitude towards jewelry has changed most drastically during the 20th century. Jewelry was seen as sacred and precious; however, beginning in the 1900s jewelry has started to be objectified. 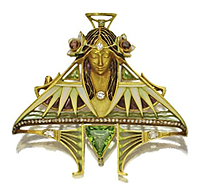 Throughout the twentieth century jewelry design underwent drastic and continual style changes: Art Nouveau (1900-1918), Art Deco (1919-1929), International Style & organicism (1929-1946), New Look & Pop (1947-1967), Globalization, Materialism, and Minimalism. Jewelry design trends are highly affected by socio-economics. Asprey was founded in 1781 in Mitcham, South London. The company consolidated its position through shrewd acquisitions. In 1859 Asprey absorbed Edwards, an award winning maker of dressing cases and holder of a Royal Warrant. Asprey established its reputation as the premier maker of luxury goods by winning a gold medal for its dressing cases at the International Exhibition of 1862. 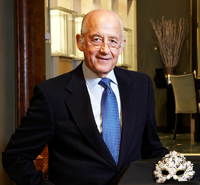 In the same year Asprey was granted a Royal Warrant by Queen Victoria. Throughout the nineteenth century business flourished and another Royal Warrant was granted by the Prince of Wales – later to be crowned Edward VII, who remained an important and enthusiastic client of Asprey. Patronage came not just from the British royal family and aristocracy but foreign royalty and dignitaries who would visit the store while in London. At the time of Edward VII’s funeral an Asprey member of staff remembered “practically all the ruling heads of state were there, and many of them came to Asprey. You might have seen three or four of them at one time.” During the 20th century Asprey grew considerably as the company acquired new manufacturing facilities and hired the finest silversmiths, goldsmiths, jewelers and watchmakers. Asprey employed the finest craftsmen, including Ernest Betjeman, the father of the distinguished poet John Betjeman, and one of the most highly regarded designers of his day. The company is most famous for the “Asscher Cut” patented in 1902 by Joseph Asscher. The cut consists of a square cut diamond with chopped corners, a three-step crown, and a seven-step pavilion. The design, which presented a notably small table, allowed for a marked amount of reflected light, creating a sound measure of brilliance. This emblematic cut was the first signature cut to be patented. Over the early parts of the twentieth century, Joseph Asscher continued to refine what was quickly becoming known as the Asscher Cut Diamond. He eventually reduced the steps in the crown to two or three cuts, and the pavilion to three or four steps. The modifications to the Asscher cut increased the overall brilliance of the stone. During the Roaring Twenties Art Deco became the style of the day, daring angles were being set off with grand sweeping curves, and the dramatic cut of the Asscher diamond not only fit into this design aesthetic – it came to exemplify it. Leading up to World War II the Asscher Diamond Company, as it was renamed in 1936, had great success, largely due to the popularity of the Asscher diamond and their exclusive patent for the cut. However, the approach of the Nazis and the outbreak of WWII nearly brought the demise of the Asscher company and family. During the war Amsterdam was occupied by Nazi forces, who seized all of the diamonds at the Asscher headquarters and deported the entire Asscher family and most of the diamond polishers employed by the firm to concentration camps. Only ten Asscher family members and fifteen of the original five hundred diamond polishers survived the concentration camps. Joop and Louis Asscher began to rebuild the company, remaining in the original Amsterdam location but focused their efforts on building sales in New York. The De Beers company was able to lend a hand, providing the Asschers with rough diamonds and access to the company’s diamond sights. Through this help, the Asschers were able to regain some of the strength that they had before, returning to their status as a first class diamond cutting company. 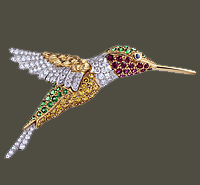 Louis Aucoc (1850- 1932) was a renowned nineteenth-century French jeweler and goldsmith who came from a family of established goldsmiths. 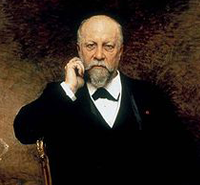 In 1877 he bought the Parisian firm “Lobjois” and changed its name to “La Maison Aucoc.” The firm excelled due to Aucoc’s winning personality and his great skill as a goldsmith and refined aesthetic. The jewelry wasn’t particularly innovative, but the firm remained popular and kept a pace of the emerging Parisian jewelry trends. The firm’s Art Nouveau pieces were very highly regarded. Pieces feature exquisite chsed gold and enameling with finely set diamonds. 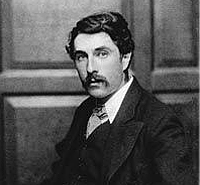 From 1876 to 1878 Rene Lalique, later a leader of the Art Nouveau movement, was apprenticed to Aucoc. During Lalique’s apprenticeship “La Maison Aucoc” was established and the firm participated in major international exhibitions. After Lalique left the firm and established himself as a leading designer, Aucoc collaborated with designer Landois and created jewelry in the “Genre Lalique.” Shortly afterwards Aucoc retired and the business was managed by his brother, who turned its focus to silverware. 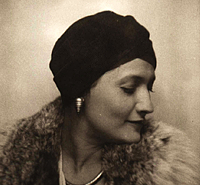 Suzanne Belperron (1900-1983) was an iconic Parisian jewelry designer who insisted “Mon style est ma signature.” Her jewelry embodies a sensual elegance as well as an intellectual fascination that appealed to a sophisticated clientele from socialites to stage and screen stars. Working until the 1960’s she never signed a piece believing that her work was so distinctive that the jewel itself was her signature. Her pieces can be identified by the marker’s mark of Darde et Groene, who produced her designs, additionally many of the pieces she made in partnership with Bernard Herz are signed “Herz-Belperson”. However, it takes a trained and discerning eye to identify her unsigned and unmarked creations, and since almost no archives remain. Her works are immensely rare on the market. A very private person, Belperron burned her personal papers and photographs, and, after years of obscurity, has only recently been rediscovered. 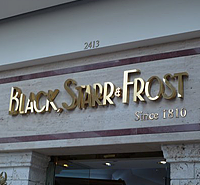 Black, Starr & Frost is one of the oldest operating jewelry houses in America. Founded in 1810 by Erastus Barton and Frederick Marquand it was originally named Marquand and Barton located near New York’s Maiden Lane. The firm added and lost partners numerous times; it also frequently moved locations, depending on the whereabouts of its prestigious clientele and carried an eclectic mix of lamps, jewelry, porcelain, paintings, and other art objects. 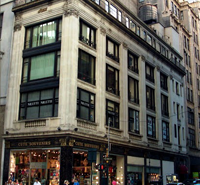 In 1876 the firm moved to 251 Fifth Avenue, changed its name to Black, Starr & Frost and concentrated its inventory on jewelry and silver objects, some produced in-house, others imported from Europe. The Italian firm of Buccellati (Founded 1919) is famous for textural gold jewelry and exquisite silver objects. The main design accomplishments of the Buccellati firm span four decades: from the 1920’s to the 1960’s. The pieces are bold and instantly recognizable, with a style that references the great goldsmiths of the Renaissance. The most distinctive aspect of Buccellati pieces is the rich textural quality, Mario Buccellati was the first to introduce the technique of texture-engraving. The most renowned engraving techniques are rigato (parallel lines cut onto the surface of metal to obtain a sheen effect), telato (texture, obtained by fine cross-hatched lines, which imitates linen surface), segrinato (engraving in every possible directions, overlapping textures), ornato (decoration, based on nature forms: animals, leaves, flowers), modellato (the most delicate engraving technique, which consists of reproducing several designs chiseled in three dimensions on a minuscule scale, mainly used for the decorations of the borders). Pieces are created to look and feel like silk, damask, tulle, lace, or linen. Use of mixed metals (silver and gold, platinum and gold) is also typical. 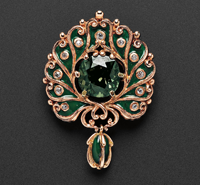 If gemstones are used at all, they are often unusual: large cabochons, carved emeralds and rubies, rose-cut diamonds. In 1905, he sold off his chain shops to concentrate on a single jewelry and silver business. 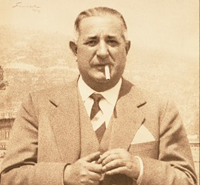 He and his sons Costantino and Giorgio opened a store on Via dei Condotti 10. The store, which remains the Bulgari headquarters today, offered an upscale selection of goods from embossed and engraved silver serving pieces to gold and silver jewelry. Gradually the Bulgari brand cultivated a cosmopolitan air, and the shift to pricier bejeweled pieces began. Founded in Paris in 1847, by Louis-Francois Cartier, the firm known as Cartier quickly became recognized for its exemplary workmanship and taste. 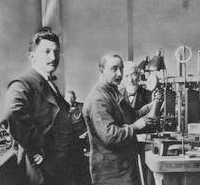 Louis-Francois Cartier began his esteemed career at 28, after an apprenticeship with master watchmaker Adolphe Picard resulted in Cartier taking over the master’s workshop, 29 rue Montorgueil, Paris. He expanded the premises, and built his reputation on knowing how to satisfy the most extravagant of desires. By 1853 Louis Francois was able to move his business to the more fashionable Palais-Royal district at 5 Rue Neuve des petits Champs. He became a favorite of Princess Mathilde, the cousin of Napoleon III, whose patronage opened the door to Parisian society. Among Louis Cartier’s most important and lasting innovations was introducing the combination of platinum and diamonds to create garland style jewelry. Cartier wove the platinum into extremely fine threads in order to bring out the sparkle of the diamonds, making platinum a legitimate and irreplaceable precious metal in jewelry making. In 1904, Brazilian aviator Alberto Santos-Dumont, asked close friend Louis Cartier to design a watch that could be used during his flights, since pocket watches were not suitable. Louis Cartier created for him the Santos wristwatch, the first wrist watch made for men. The Santos first went on sale in 1911, the date of Cartier’s first production of wristwatches. Castellani, Founded 1815. One of the distinguishing characteristics of the 19th century was a reverence for the past. This was the age of the Grand Tour, when the popular imagination was sparked by visions of antiquity, the Middle Ages, and the Renaissance as the refined upper classes returned home bursting with information and purchases from their trips abroad. In Italy, ancient gold Etruscan jewelry was turning up in excavations, and society women were captivated by its beauty. Roman jeweler and art dealer Fortunato Pio Castellani saw his opportunity and swiftly presented the public with an easy alternative to the ancient by developing a chemical method to reproduce the warm, deep yellow tones of the ancient gold. For three generations the Castellani family created what they called “Italian archaeological jewelry,” which was inspired by the precious Etruscan, Roman, Greek, and Byzantine antiquities being excavated at the time. 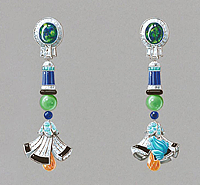 The Castellani jewelry consisted of finely wrought gold that was often combined with delicate and colorful mosaics, carved gemstones, or enamel. The founder of Chaumet, Marie-Etienne Nitot had worked with the jeweler to Queen Marie-Antoinette before opening his own shop in 1780. He quickly gained an aristocratic clientele and reputation. From 1802 onwards Nitot and his son Francois Regnault, were Napoleon’s personal jewelers, creating symbols of power and exuberance for the Emperor who wore the powerful jewels as a political statement. 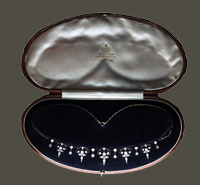 Nitot created the consular sword, Crown jewels for the coronation of Napoleon and the imperial broadsword. For Princess Joséphine, the wife of Napoleon, he created sentimental and bold jewels to suite her eccentric taste. After the fall of Napoleon, the business continued under the direction of Jean-Baptiste Fossin and his son Jules. The father and son created romantic jewels inspired by the Decorative Arts of the Italian Renaissance and French 18th Century. They sculpted the jewels into vine leaves, olive and chestnut trees, hawthorn, and grapes using topaz, emerald, ruby, and diamond. Among their elite clients were the Duchess de Berry, the French Royal family, Russian Prince Anatole Demidoff, and successful painters, sculptors, writers, and theater artists. Marcel Chaumet replaced his father in 1928, and adapted the houses style to reflect the geometric styles of the Art Deco period. The jewels, like the style itself, were characterized by strongly contrasting colors, materials, and by the use of semi-precious stones to achieve desired visual effects. The firm closed in 1934 during the Depression, but reopened and thrived following World War II. Chaumet asserted itself as a pioneer of the period, which ushered in Christian Dior’s New look and the revival of Paris as the center of fashion. The firm is still creating exceptionally crafted jewelry at the Place Vendome. Founded in 1965, Henry Dunay began his meteoric rise to the top of jewelry fame as a message boy for an elderly master goldsmith in New York. After apprenticing through his adolescence, Henry Dunay founded his company nine days after turning twenty-one. He went on to win 53 international awards for his designs, and became legendary for his craftsmanship and selection of the most beautiful stones. His original designs featuring carefully crafted pave-settings have given way to modern gold pieces with a variety of finishes, but the integrity and unique aesthetic of a Henry Dunay piece has remained consistent throughout his fifty years in business. Throughout his five decades as a designer and businessman Dunay has always focused on quality, craftsmanship, and stone quality while maintaining a strong work ethic and passion for his creations. Dunay contends that with all of his great, one of a kind designs, first he finds the perfect stone, and then he builds around it. The firm of Dreicer & Co.( 1904-1923) was one of the top luxury jewelry retailers in America during the first quarter of the 20th century. The firm is believed to have originated as J. Dreicer & Son representing the Parisian firm A. Eknayan and displaying an extensive array of diamond jewelry during the 1904 Louisiana Purchase Exposition. The emphasis on diamonds at the St. Louis exposition would characterize the firm’s production and resulting strong reputation from about 1910 through the 1920s. Though it is not clear in what year the firm opened its boutique in New York City at 560 Fifth Avenue, the jewels within rivaled Cartier with luxurious designs in platinum and diamonds as well as pearls. The firm catered to the elite, and maintained a branch at the Blackstone Hotel in Chicago. Dreicer & Co. is credited as the first company to introduce in New York many of the latest diamond cuts from Paris. 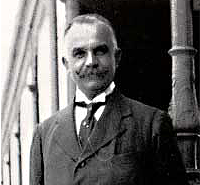 The shop was liquidated in 1923 following the death of Michael Dreicer, the founder’s son, in 1921. Cartier bought Dreicer’s stock of jewels for $2.5 million. The nature and artistic circumstances of Lucien Gautrait (1865-1937) are mysterious. 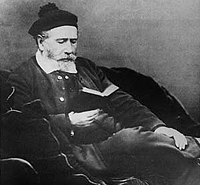 Little is known about Gautrait, and even records of his name are unreliable, ranging from the common ‘Lucien’ to some who referred to him as ‘Leopold’. The jewelry industry at the turn of the century was highly confusing, with no set regulations. It was hard to determine if the name attributed to a piece denotes designer or craftsman, manufacturer or retailer. 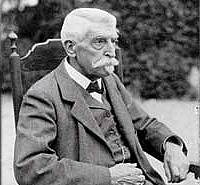 Verver, a successful jeweler of the Art Nouveau period whom Gautrait was said to work for as well, refers to Gautrait as a ciseleur-modeleur and fidele collaborateur of the Parisian jeweler Leon Gariod. The famous American firm of Oscar Heyman & Bros.( Founded 1912) can trace its origins back to the Fabrege workshop in Russia, where the brothers gained invaluable experience working with platinum and creating tools for the jewelry industry. In 1912 the remaining three Heyman brothers and three sisters left Latvia to join the family in New York, and the firm of Oscar Heyman & Bros. was established on Maiden Lane in Lower New York City. The family took pride in their work and created a self-contained system of manufacture where quality was closely monitored every step of the process. The firm still makes its own tools, alloys its own platinum and gold, and designs and creates each piece to meet demanding specifications. Maison Lacloche Frères (Founded 1901) was a retail business which selected its works from the top talented designers and workshops of Paris that the public was unaware of. Calling on workers for the great jewelers, Louis Girard, Georges Verger, Rubel, Georges Lenfant, Strauss-Allard-Meyer, and Halluin-Matlinger, the reputation of the firm as one of the premiere jewelers of on trend pieces grew rapidly after the 1925 Exposition Internationale in Paris. The Lacloche brothers drew their inspiration from Oriental and Chinese art as well as the fables of La Fontaine. 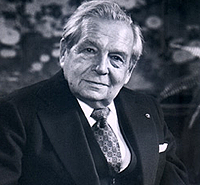 In 1936 Jacques Lacloche opened a jewelry shop at 8 place Vendôme with the name SARL Jacques Lacloche. The SARL shop remained open with Jacques Lacloche, nephew of the original Lacloche brothers, until 1966 when he closed to pursue a career in Contemporary Art. 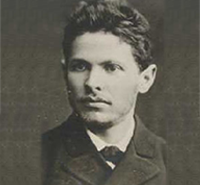 In his time, Joseph Marchak (Founded 1878) was considered by the people to be in the same league as the famous Russian goldsmiths Sazikov and Khlebnikov. One could come across his name as frequently as the famous brands Faberge and Bolin in the reports about the Nizhny Novgorod Fair of Art and Industry of 1896. Today, jewelry historians state that the works by Marchak embodied the best features of the art of jewelry in the borderline period of the late 19th and early 20th centuries. The items created by the master were distinguished by their professionalism, artistic taste, humor, originality, and superb workmanship. While the House of Marchak created an array of masterpieces, most of them did not survive the storm of revolutions, wars and historical cataclysms and were lost forever. In 2000, one of the only heirs of Alexander Marchak to bear the Marchak name decided to revive the brand of his great-grandfather by creating a new collection. The collection has traveled around the world, in Saint Petersburg, Moscow, the United States, Japan and Australia. 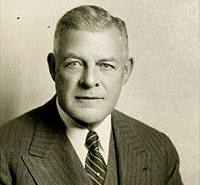 Herman Marcus immigrated to New York City from Germany in 1850 and found employment with Tiffany & Co. After leaving Tiffany & Co., Herman Marcus went into a partnership with Theodore B. Starr in 1864, forming Starr and Marcus. In addition to jewelry the firm sold bronzes, clocks, household ornaments, medals, and silverware, which later became the company’s most popular product. 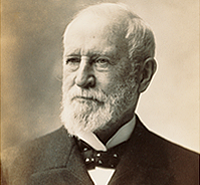 The firm of Starr and Marcus dissolved in 1877 for unknown reasons, and Herman Marcus returned to Tiffany & Co. before again leaving in 1884 to join the firm of Jaques and Marcus, of which his son William elder Marcus was already a partner. Jaques and Marcus opened a shop at 857 Broadway and began a publicity campaign to draw in customers. In 1882 Jaques and William Marcus published a book entitled “something About Neglected Gems” which highlighted colored gemstones they believed had been previously overlooked in the jewelry industry. Setting themselves apart from the all white diamond look that was popular at the time, the firm created colorful pieces using zircons, chrysoberyls, tourmalines, opals, garnets, beryls, spinels, and peridots. 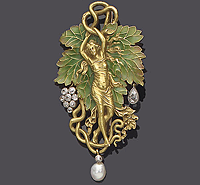 The French jewelry firm of Plisson et Hartz excelled at making jewelry in the Art Nouveau style, as well as gold chimerical and animal designs. Begun in 1872 by Plisson and partner Bottentuit, Plisson directed the firm alone from 1886 to 1898, when he was joined by longtime associate Hartz, the creative force behind their designs. 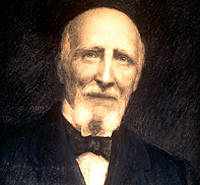 Plisson continued in the company until his death in 1904, at which time Hartz continued the firm as Hartz et cie. The firm was the first to produce chimerical jewels, those of gold griffins and mythical monsters. Using the goldwork techniques developed in France during the 1870’s and 1880’s, jewelry firms such as Plisson et Hartz began to create a variety of mythological creatures. Initially the public disliked the designs, however soon the tide shifted and Plisson et Hartz chimerical jewelry became extremely popular. The firm also interpreted this trend to encompass Art Nouveau themes, such as the very desirable mermaid motif. Also popular were diamond animal jewels and designs depicting baskets of flowers in a variety of stone and enamel settings. 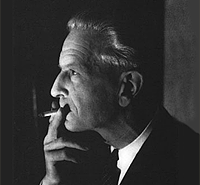 Sterlé (Founded 1945) was a major award winning designer notable for his innovative approach to jewelry design using baguette-cut diamonds and colored gemstones in sweeping, curling lines. His love of nature played out in his favorite motifs: birds, flowers, leaves, arrows, feathers and bows. 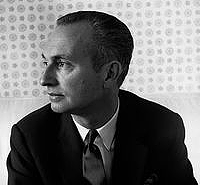 Sterlé’s designs epitomized the dynamics of 1950s design and were wrought with great movement and energy. 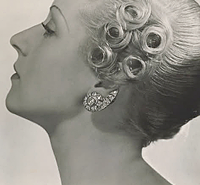 Aside from the sheer beauty and grace of Sterlé’s work, his greatest contribution to the jewelry industry was the invention of a gold plaiting technique called Til d’ange, permitting the creation of fringes, manes, tails, and flower accents. Tiffany & Co. (Founded 1837) is one jewelry firm that really needs no introduction. Tiffany’s flagship store is located at the corner of Fifth Avenue and 57th Street in Manhattan, New York City since 1940. The polished granite exterior is well known for its tiny window displays, and a 128.54 carats Fancy Yellow Tiffany Diamond usually is on display the store. Begun as a stationary and novelty shop, the firm now known as Tiffany & Co. is synonymous with quality and excellence in American silver and jewelry. With schoolmate John B. Young, Charles Louis Tiffany opened Tiffany & Young on September 18, 1837. Tiffany began selling classic silver designs, created by John c. Moore, the firm’s exclusive silver designer after 1851. The firm won the highly coveted Award of Merit at the Paris Exposition Universelle in 1867. This was the first time an American company had been recognized by a European jury. Soon Tiffany and Company’s list of customers included the Prince of Wales, the Duke of Edinburgh, Prince Leopold, and the Grand Duke Alexis of Russia. In 1883 the firm was designated jeweler to Queen Victoria, and within a year similar appointments followed from the Czar and Czarina, the Emporer of Austria, the kings of Belgium, Italy, Denmark, Greece, Spain, Portugal, and Rumania, the Khedive of Egypt, and the Shah of Persia. 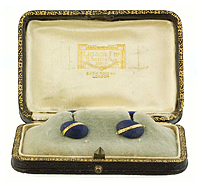 As the firm’s reputation for quality jewelry rose they gained many important commissions, including a Tiffany seed-pearl jewelry suite designed for Lincoln’s inauguration and given by the President to Mary Todd Lincoln in 1861. In 1878 Tiffany & Co. purchased the Tiffany Diamond, one of the world’s largest and finest fancy yellow diamonds. 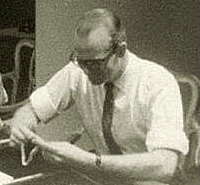 The firm hires Dr. George Frederick Kunz, the first gemologist to be hired by a jeweler, to oversee the cutting of the stone. In 1886 the Company introduced the famous “Tiffany Setting” for engagement rings. The 6-prong diamond solitaire ring maximizes the beauty of the stone by raising it up from the band and into the light. In 1883 and again in 1887 Tiffany and Company purchased several auction lots of French crown jewels, and for years the firm’s annual diamond sales totaled more than $6 million. Sales of pearls, emeralds, rubies, and sapphires accounted for at least that much more. This was the “Gilded Age” in America, and Tiffany and Company both encouraged and helped enable the rich to showcase their wealth. The press dubbed Charles Lewis Tiffany “the King of Diamonds” and the firm establishes itself as a world leader in fine jewelry. 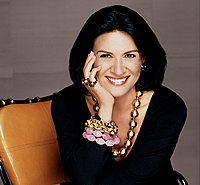 Tiffany designs graced women from the finest families: the Astors, the Vanderbilts, the Morgans. Celebrities from the theater, sports and ultimately European royalty and Hollywood stars began to prize Tiffany diamond designs. The Van Cleef & Arpels (Founded 1906) brand instantly conjures up the concept of diamonds, rare rubies, sapphires and emeralds. The high-jewelry house consistently strives to improve methods of cutting stones, mounting, and crafting pieces that are treasured through generations. Faithful to the spirit of their founders, each piece of Van Cleef & Arpels jewelry is designed to enhance the beauty of exceptional stones. Although Van Cleef & Arpels has purchased exceptional specimens, it has also brought rare but less valuable stones, such as aquamarines, mandarin garnets and rubellites, to light. Van Cleef & Arpels sometimes chose to highlight the poetry of more unexpected materials, such as mother-of-pearl, snake-wood and lacquer. In the late 1940’s on Manhattan’s Madison Avenue, the doors opened to the flagship store of one of America’s greatest jewelry manufacturers: David Webb (Founded 1945). Webb’s designs are distinguished by a bold use of color, dimension, and meticulous attention to detail. David Webb is possibly best known for his enamel jewelry of animal themes, where frogs look like they could jump off of the wearer’s cuffs or lapels, and bangles host zebras, crocodiles or intertwining dragons. These pieces have been beloved by socialites and Hollywood for more than sixty years. Webb’s designs also include carved crystal, abstract enamel designs, mixed with an eye catching combination of diamonds and semi-precious stones. Design inspiration came from many sources. Taking the animal kingdom as inspiration, Webb used enamel and colored stones to bring the creations of his imagination to life. Other important influences on his design sense included Faberge, Cellini, and other master jewelers from the 1800’s and early 1900’s who approached jewelry as art, not a commodity. He was also taken with the aesthetics of the ancient Greeks, Chinese, and Egyptians. The boldness of these designs was reinterpreted to suit the modern era using modern materials. The result was a look that established David Webb as a groundbreaking jewelry house and the destination for statement jewelry. Tragically, David Webb died young of an aggressive form of pancreatic cancer in 1975 but not before leaving an incredibly rich and diverse archive of bold, beautiful and intricate jewelry to be treasured and carefully preserved for generations to come. To this day, his vision and legacy are carefully preserved by Nina Silberstein, his original business partner and her family in the Manhattan atelier bearing his name. Each piece is still carefully crafted from start to finish by skilled artisans in a workshop located above the flagship Madison Avenue store, the last of its kind in New York City. David Webb original jewelry still remains highly collectible. The name of “Harry Winston” is known as one of the world’s most prestigious jewelry companies. It is a name linked to most beautiful jewels, settings, and to luxury and exclusivity. Inspired by the endless energy of New York, Harry Winston opened his doors in 1932, and began a process of transformation, turning diamonds into art and revolutionizing modern jewelry design. Every piece of Harry Winston jewelry begins with a study of the individual gemstones to inspire a unique and extraordinary design. This diamond-driven style is a collaboration of efforts and skills — gemologist, designer and craftsman — working together to create impossibly beautiful jewels. Using near invisible platinum settings, stones are meticulously set by hand to achieve the perfect dimension, proportion, and angles of reflection. The signature and standard of Harry Winston jewelry designs is the diamond-driven style that produces a quality and aesthetic that endures. The company is named after its founding father, Harry Winston, who started his business from a small shop in Manhattan’s Upper West Side, and went on to be as famous as the diamonds and jewels he collected and sold. Harry Winston was a second generation immigrant to the United States. Winston’s father, Jacob, had emigrated from the Ukraine in 1890 and established a small workshop and jewelry repair shop in Manhattan with his wife that same year. Harry Winston was born six years later in 1896 and was brought up under his father’s guidance, learning about precious stones and jewelry first hand. When Harry was seven his mother passed away and the family moved to California to establish an outlet in Hollywood. It was during this period that the legend of Harry Winston began. A common story is told that at the age of twelve Winston brought a ring from a junk tray in a pawnshop. Winston was said to have recognized the two-carat emerald and bought it for 25 cents, two days later he supposedly sold it for $800. Winston soon began purchasing jewelry from estate sales, in which precious jewels were available for purchase cheaply because the settings were old fashioned and out of style. Winston refashioned the stones with new settings and sold them for a large profit. In 1925 he purchased the jewelry collection of Rebecca Darlington Stoddard, a wealthy Pittsburgh coal and iron heiress for $1million, and the following year he purchased the celebrated collection of Arabella Huntington for $2million. His practice of purchasing estate jewelry and refashioning the pieces for resale made Winston a wealthy man again. In 1930 he gained national fame with his purchase of the Baldwin collection, which included a 39-carat emerald-cut diamond. The Hope Diamond was joined by the sapphire of Catherine the Great, the Star of the East, the Inquisition Necklace and others. The Court of Jewels was another expression of Winston’s love of gemstones. He wanted to share the beauty of a well cut gem with the public. This desire led to the donations of the Hope Diamond in 1958 to the Smithsonian Institution, the Portuguese Diamond in 1963 and the Oppenheimer in 1964. Using only the highest quality gemstones and the most exquisite platinum mountings, Raymond Yard (Founded 1922) designed jewelry that not only took on an identifiable style of its own, but also elevated Art Deco jewelry to a new level. Raymond C. Yard differentiated itself from other jewelers in the art of rebuilding jewelry with its exquisite 20’s and 30’s art deco pieces. Today, the name Yard is synonymous for the highest standards in fine jewelry.